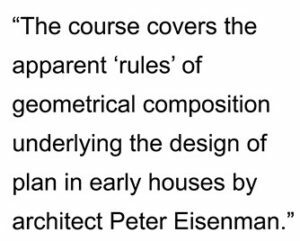 The course covers the apparent ‘rules’ of geometrical composition underlying the design of plan in early houses by architect Peter Eisenman. 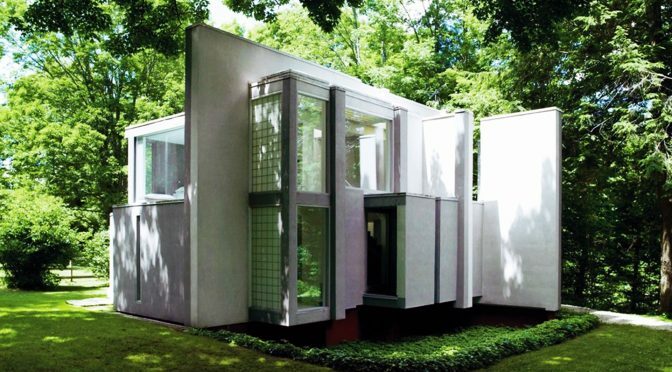 The effect of these compositional rules, tied to the design process of ‘decomposition’ as described by Eisenman, in the generation of layout in these houses is examined using some basic representational techniques in the space syntax toolkit. In particular, this includes the effect in structuring the relationships, if any, between public (e.g. everyday living) and private (e.g. bedrooms) functions as well as the household interface between inhabitants and visitors. The course offers a better understanding of the relationship between the architect’s stated aims in his own theoretical writings and the probable functioning of these houses as architectural objects (1.0 hour course). NOTE: This course does make use of some basic space syntax analysis. However, even if you are not familiar with space syntax, it should not be considered a deterrent. Key concepts: architectural theory, composition, deconstructivism, domestic functions, plan geometry, genotypes. Includes a one-hour video presentation and PDFs of class notes and slide handout.